A thick chunk of banana, mashed. Some cut up pear, mashed. 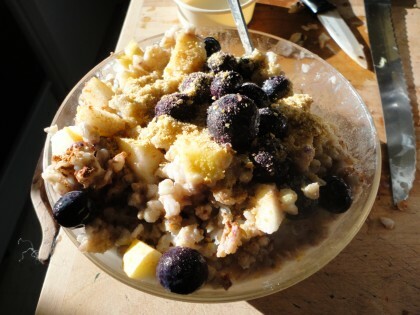 Buckwheat groats and gluten free oats, cooked together. A splash of almond milk (homemade). A teaspoon of ground golden flax seeds. A little sun right on the bowl. A silver spoon to eat it with. Should have been sweet! A mere slip of a finger can cause all sorts of trouble!